Because it allows us to charge for the product in a manner that's somewhat commensurate with how the product is used. A professional workshop that's in and out of several vehicles a day with their VCDS gets considerably more value from the product than a private individual who only uses it occasionally one one or two of his own cars. When the previous generation of interfaces was designed 10-12 years ago, most VW/Audi cars on the road did not yet know their own VIN, so it was not really practical to restrict usage that way. Hence the pricing on our universal interfaces (interfaces that worked with all the cars available at that point) had always something of a compromise. Plenty of workshops told us that VCDS was the best value for the money of any tool they'd ever bought and that we could/should charge more, but we were already at or close to the limit of what an enthusiast would pay, and enthusiasts were (and still are!) a very important part of our business. In fact, the reason this product exists is that I got frustrated that I couldn't trouble-shoot my own cars anymore in the late 1990s. Some pros suggested that we make a less expensive version for enthusiasts by restricting the what the enthusiast version could do, but that was not an approach that was palatable to me. So now a decade later, most of the cars people are working on do know their VINs and restricting the number of cars an enthusiast can perform certain functions on seems like a reasonable way of differentiating between a "pro" and a private individual. Will VCDS count a car's VIN as toward the license limit as soon as I plug into a particular car? No! VCDS will never count a VIN toward the license limit without the user's explicit permission. It will always ask you first, thereby giving you the opportunity to decline to "register" a VIN in the interface. Besides, there are a lot of useful things you can do on an unlimited number of cars. 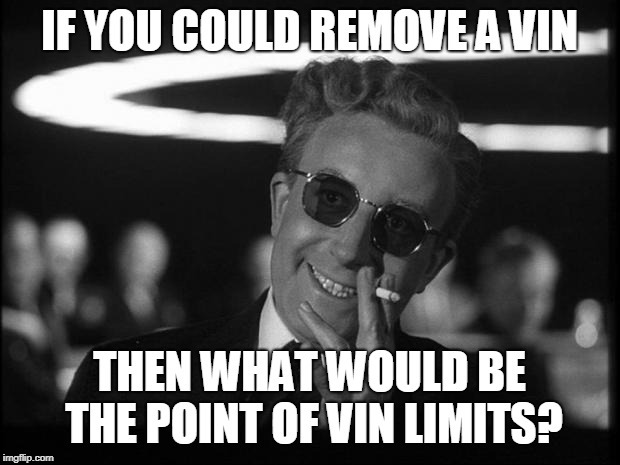 What functions are not VIN-Restricted? A VIN-Limited interface can do Auto-Scans, Clear DTCs, and look at Measuring Values on an unlimited number of cars. I think this is important because I wouldn't want to keep an enthusiast from doing basic diagnostics on his friends' cars, or to use his VCDS when evaluating used cars he's contemplating buying. You wouldn't buy a used car without doing an Auto-Scan on it first, right? In addition, you can make channel maps on an unlimited number of cars because sending us those maps helps us improve the product. In addition, directly accessing a control module outside of an Auto-Scan will prompt the user whether he wants to "register" that car's VIN, but declining to do so at that point will not prevent access to the module. What about older cars that do not know their VIN? Simple: They are free. You can do anything and everything on those cars without them counting toward the license limit. Which cars do and don't know their VIN? Virtually all model year 2002 and newer do know their VINs -- basically those cars with Immo-3 and up. I believe the only model year 2000 car that had Immo-3 was the Audi A8, but a few others got Immo-3 in model year 2001. If I sell one of my cars, can I de-register and free up that VIN slot? No, it doesn't work that way. VINs are stored permanently. They cannot be erased. Can I upgrade a 3-VIN license to 10 VINs, or a 10-VIN license to Unlimited? Yes, absolutely. There's a provision for that in our store. What if I'm swapping components from different cars? If you're swapping components with like instrument clusters or ECUs that have different VINs stored in them, you may have to register each of the different VINs. PS: If you have additional questions, please feel free to ask right here. Last edited by Uwe; 03-12-2019 at 10:02 AM. So is there going to be an unlimited VIN (or professional) V2 available? Or is it just buy the 10 VIN product and use the upgrade path? UWE, can old cable be trade in for HEX-V2? That doesn't answer the question though. Question is "Can I buy an unlimited VIN V2 product or do I have to buy a 10 VIN product and then upgrade to unlimited VIN?". I'm well aware that I could upgrade a 10 VIN to unlimited, but I want an unlimited one so it would seem a little pointless buying 10 VIN and then paying again for unlimited if a single payment option was available initially. Is there a place in the software that will tell me how many VINs are permanently stored on my 3-VIN or 10-VIN VCDS? Will the the software show that my VCDS has unlimited VINs if I pay for the upgrade from 10-VIN to unlimited? I know Gendan sell them. I was asking for the "Official line" on what's available and possible pricing. Ross-Tech is not offering that configuration in the NAR market at present. However, some of our authorized resellers in other markets are. A trade-in upgrade program is coming, but details have not been completely finalized yet.